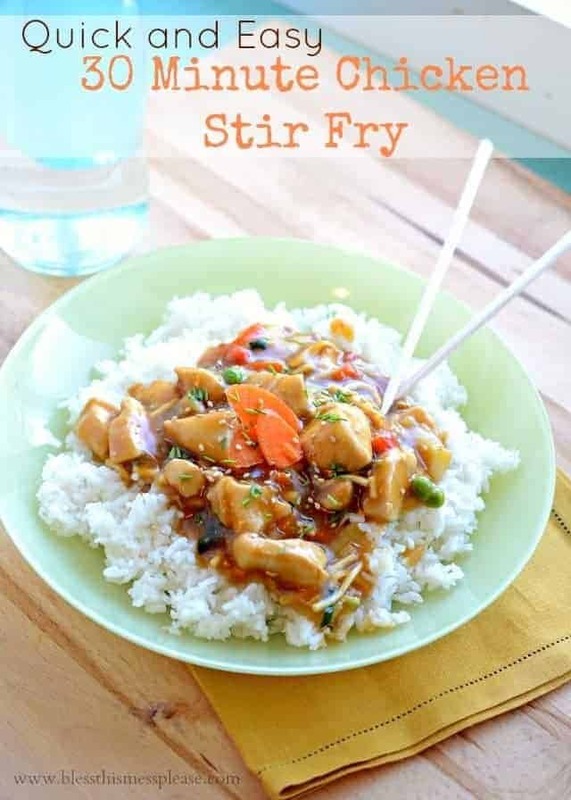 I love this quick and easy stir-fry recipe! I got this recipe from my sister (Hi, Lachelle!). 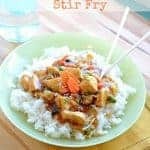 The idea is that you cook up a little chicken, throw all of the ingredients for the sauce in a mason jar and give it a shake, add the sauce and cook, add some frozen veggies (Costco has a fabulous organic frozen stri-fry vegetable medley that we love), and then serve it all over hot rice. It takes less than a half hour to throw together and the whole family loves it. It’s always a winner and one that will go in your quick meal rotation with ease. Enjoy and pin it for later! 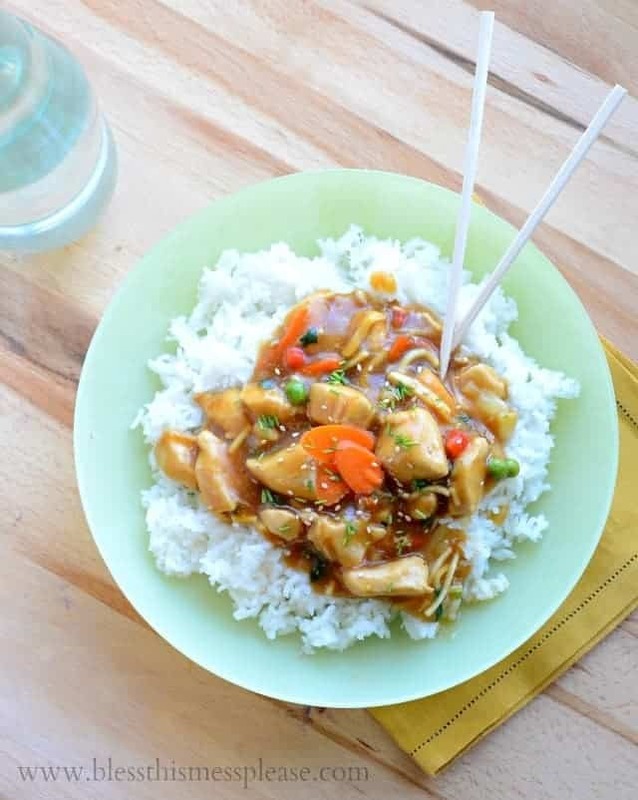 Quick and easy chicken stir-fry. Cook the chicken, throw all of the sauce ingredients in a jar and give it a shake, use frozen veggies. This couldn’t be easier! Heat a large nonstick or cast iron skillet over medium to medium-high heat. Add the oil and heat for 30 seconds. Add the chicken and cook until the chicken is cooked through and no longer pink in the center. While the chicken is cooking add all of the sauce ingredients to a quart mason jar, add a lid, and shake well to combine. When the chicken is cooked through, reduce the heat to medium and pour the sauce over the chicken. Stirring continuously cook until the sauce thickens and the color changes from a muddy brown to a more clean reddish color. This should take about 3 minutes. Add the frozen vegetables and cook until the veggies are heated through. Serve the chicken, sauce, veggie mixture over hot cooked rice and garnish with chopped green onion and sesame seeds if desired. Enjoy! To ensure there are no cornstarch lumps in the sauce I recommend combining the corn starch and the cold water and shaking those together well before adding the additional ingredient. If you’d like the sauce a bit spicier make it a few hours ahead of time with the red pepper flakes. Let the sauce rest in the fridge and reshake before you are ready to use. Letting the pepper flakes sit in the sauce will gives them time to release more of their heat. Have a great day and enjoy this recipe from my kitchen to yours! Your stir fry looks amazing Melissa!! This is a guest post that I did earlier this year, so you just have to click on the link above the picture to get the recipe! This is absolutely delicious! Made my grocery list using your Summer/Spring Clean Eating suggestions. If they’re all as good as this, you’re my hero! When u use fresh veggies, do u cook the veggies first, or chicken, or all at once? Got grumbled at by the hubby for experimenting…again. Its a no no to serve dinner that isn’t guaranteed yummy. So…I cut the recipe in half, served it with brown rice for me, and jasmine rice for him. He said it was pretty good! Lucky for him he liked it; there is plenty of goodness left for dinner tomorrow night….tee hee! Thank your sister for a great recipe! What kind of vinegar do you use for this recepie? I like rice vinegar or white best but apple cider works well too! I made this tonight and it was so easy and delicious. I used almond flour instead of corn starch and the sauce still turned out great. It’s very sweet with all the honey, but we loved it. Delicious! I didn’t have honey so I substituted with brown sugar. Loved it! Great sub, thank you for sharing and leaving a review Lisa! My husband cannot stop loving on this recipe – and he is picky! I made it tonight for the first time and halved the recipe as we only had 1lb of chicken and it was perfect. Everything about it. Consistency. Spice level (medium). Not too salty. Also not too sweet. We didn’t have regular white vinegar so used champagne vinegar. Beautiful. I can’t think of one change I would make! Thank you for sharing this recipe!! Oooh that sound delicious! Thank you for the tip and coming back to let us know and leaving a great review, I really appreciate that! This is a delicious, no-fuss stir fry that is quick to make. I used white wine vinegar, a pinch of red pepper flakes and put the marinade in the fridge as suggested. It turned out wonderfully. My family loved it! So glad that you liked it! Thank you for coming back to let me know!